PiggieLuv: And even more Gothic Gala Lacquers! I'm baaaaaack! And I have three more Gothic Gala Lacquers for you! Two of these, Beauty Of The Marina and Spice It Up, came in a mystery bag I purchased with my own money. They're one-offs and were either prototypes, not the right color or not quite right in another way, but there's nothing wrong with the quality of the polish (as you will hear from me lots of times during this review!). Tutu It To Me is something special, but I'll leave that for you to read at the end. Click here to continue! The people who know me will be laughing in their chair right now, but I don't freaking care!!! Muahahaha!! Beauty Of The Marina is a blue polish that can best be described as an 'almost' polish. It's not quite holo, but there's some sparkles of it somewhere. Out of the corner of your eye, you think you're seeing a color shift, but then when you look it's not there anymore. It also isn't really anything else, but that's the intriguing thing about this polish. The name is... well, I'm not gonna tell. If you know me, you know where the name came from. It's a mystery, just like this polish. See what I mean about this color shift? You think it's there, but then when you look it doesn't really seem to be anything, until you look away and look back real fast and you think you see it again. Or is that just me? This was smooth polishing all the way. It was opaque after two coats, and I didn't have any weird occurrences or problems, it was just the same ol' party I've come to know and love about Gothic Gala. I think the color is absolutely gorgeous and it suits me well, I just love it. I love it! This one is a kicker! It's a copper polish from the outside, but when you look closely at the macro, you can see holo, golden and magenta shimmers and sparkles. Say what now? Yeah, this polish has all of that, and more! I didn't even notice all of this until I looked at the macro on my computer screen. It's amazing, isn't it? I have to put this in bold letters: ONE COATER! Seriously, one coat was enough to hide my visible nail line, and mine doesn't hide easily. But there it was, all gone! That is just amaaaazing, I want to try out this polish for stamping because I think it would be perfect for it! There's a tiiiiiny little bit of holo visible in this picture, but not as much as I've seen at times. It was just really hard to capture without the proper sunlight. Stupid winter, I wish you would go away! It's pink. And matte. I was talking to my friend Celestine (isn't that a beautiful name?) and she said it reminded her of a ballerina. And that's how the name was born! Actually, she helped me with the other names too. Because that's how awesome she is (go to her blog and show her some love!). It's just all-round pretty and it's great quality too. It dries really freaking fast, like all Gothic Gala Lacquers do, although it was streaky here and there in the second coat. I was surprised at how well the pigment stays mixed and didn't sink, without making the polish thick or hard to work with. That is really something! It's glow in the freaking dark! Ermahgerd! Gluuuurw! I think I can even see different colors of glow pigment, which makes it so awesome to look at. 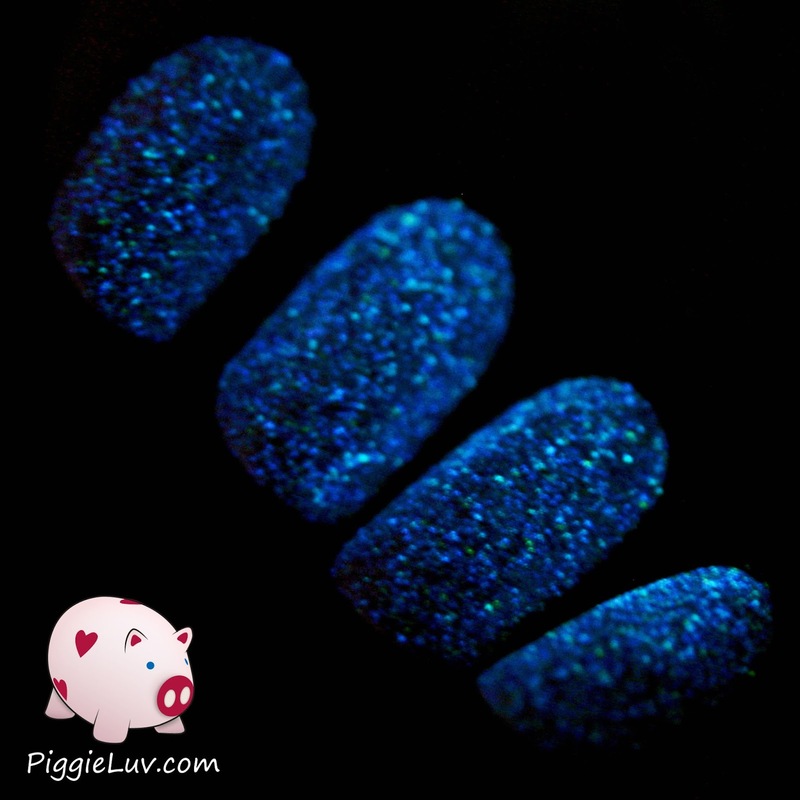 I don't think I have another glow polish (and I have quite a few already) that uses different colors like this. I love it! All of these were made by Gothic Gala Lacquers and even though these particular polishes aren't for sale, the whole shop is full of beauties that you can't miss so be sure to check it out! Also, see my other Gothic Gala Lacquers reviews from a few days ago and from September 2013. A big thanks to Samantha for being an awesome indie maker and pouring her love in to each and every single polish she creates!